In the introduction to How to Do Things with Videogames, Ian Bogost argues for “the many uses of videogames, and how together they make the medium broader, richer, and more relevant” (7). He continues, “I take for granted that understanding games as a medium of leisure or productivity is insufficient. Instead, I suggest we imagine the videogame as a medium with valid uses across the spectrum, from art to tools and everything in between” (7). 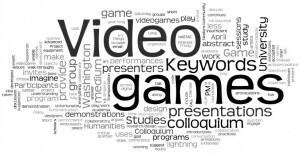 The Keywords colloquium takes up this call to imagine the power, potential, and practices of videogames as objects of study, design, critique, and fun. Send a brief abstract or rationale (500 words or less) for your presentation to critgame@uw.edu by 5 PM on Friday, April 6, 2012. Colloquium sessions will be roundtable, discussion format organized around short programs (6-8 “lightning” talk presenters) or long programs (1-3 presenters or extended performance or demonstration). Short program presentations should be less than 5 minutes to allow for question and answer and conversation. These should not be conference paper style presentations, but rather provide introductions, provocations, or focused interventions into your work, your project, or your idea. Long program presentations can be more fully developed game play walk-throughs, performances, or interactive demonstrations. Please include along with your abstract the names, emails, titles, affiliations or institutions of presenters, and your A/V requirements. Participants will be notified of their acceptance by email by April 15, 2012. Participants, if accepted, will need to arrange for travel, transportation, lodging, and equipment on their own. Unfortunately, the Keywords group is unable to provide any funding for expenses.